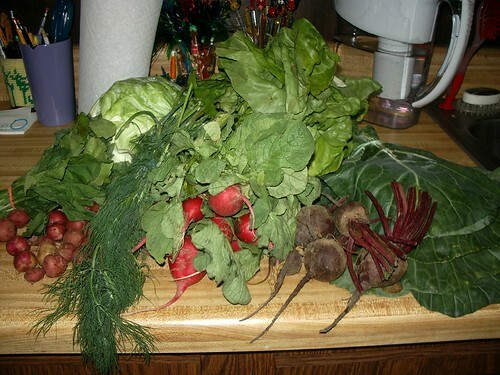 radishes (with greens), beets, lettuce, cabbage, chard, dill, small potatoes, arugula. 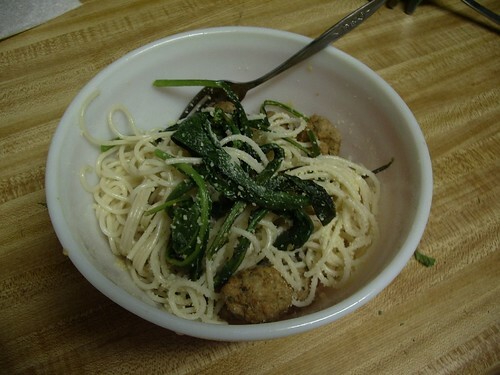 I tossed spelt pasta with wilted arugula (in garlic and olive oil), some romano cheese, and nate’s “meat” balls. I really wished I had pine nuts, but I guess I’m all out. The CSA is on the other side of my house from work now that we’ve moved offices, so it takes about an hour to get there. which is a huge bummer. I might work from the other office on wednesday but I don’t really want to! Anyway, I’m hugely excited that the season has started. This entry was posted in all posts, CSA. Bookmark the permalink.